A 3½ mile walk from Holborn (Central & Picadilly lines) to Tottenham Court Road (Central & Northern line). Exit the station and go south along Kingsway. This street was created as a north-south route in the Edwardian period and has a number of impressive buildings including the former Holy Trinity Church (1909-11) now Aviation House and Africa House (1921). A tram route was opened below the street in 1906. It was deepened for double deckers in 1930 and was last used in 1952. The northern section of the tunnel remains but the southern section is now used by cars. The entrance to Holborn Station was in the centre of the road [more info]. St Anslem & St Cecila RC Church was built in 1909. Left at Remnant Street continuing into Lincoln's Inn Fields. Sir John Soane's Museum is on the north side. The Hunterian Museum is within the Royal College of Surgeons on the south side. The former Land Registry buildings are now used by LSE. Return to the NW corner and go along Gate Street then take Little Turnstile to the right of The Ship pub. Right along High Holborn. The grand former Pearl Assurance building (1912-9) has been converted into a hotel. Cross towards Templar House and continue along High Holborn. Left at Red Lion Street then second left at Princeton Street. Go clockwise around Red Lion Square. Rossetti lived at number 16-17, later used as offices by William Morris (see plaque). Summit House was designed by Westwood & Emberton for Austin Reed in 1925. There is a plaque to John Harrison, the clockmaker on the side. Cross through the square and continue clockwise. Conway Hall, designed by FH Mansford, was built for South Place Ethical Society in 1929. There is a former Board School of 1877. There are fine Georgian houses here. There is a blue plaque to Dorothy L Sayers. Number 13 is a former coach house of 1903. Houses here were built 1756-9. The 1960s Holborn Library includes a local studies section. Opposite are the grounds of Grays Inn. Mercury House was designed as a HQ for Cable & Wireless in 1955 by Gordon Jeeves. This was built as the Central School of Arts for the LCC in 1905-8. The school has now relocated to the Granary building at Kings Cross. The entrance to the tram tunnel can be viewed in the centre of the road. On the right is Victoria House, built for the Liverpool Victoria Friendly Society in 1921-34. This is an unusual pedestrian shopping street of 1905-10. Right at Southampton Row. Cross High Holborn and go right. The Princess Louise pub has a fine 19th century interior. The former town hall was built in 1906-8 and the adjoining library in 1894. Continue along St Giles High Street. The Shaftesbury Theatre was originally the Princes, designed by Bertie Crewe in 1911. On the corner with Endell Street is St Giles' National School of 1860 by EM Barry. It had 1500 children and there was a soup kitchen and industrial school in the basement. It is now used by St Mungos. Elms Lester Printing Works of 1903-4 houses scene painting workshops. At Charing Cross Road go left. The Phoenix Theatre was designed in 1930 by Giles Gilbert Scott and Bertie Crewe. Notice the theatre elevation from this street. The Phoenix Garden is a community garden created on the site of a car park in 1984 [website]. The Odeon Cinema was formerly the Saville Theatre, designed by TP Bennett and Bertie Crewe in 1931. The frieze depicts 'Drama through the Ages'. The former Soho Baptist Church on the corner of Mercer Street is now used by the Chinese. Go northwards along Shaftesbury Avenue, crossing St Giles High Street. Go left of the triangular island along Bloomsbury Street. Britannia House of 1929 is in an Egyptian style. The Central Baptist Church was built in 1845-8. Opposite are King Edward Mansions of 1902-8. James Smith's attractive umbrella shop was established in 1830 [website]. There is a blue plaque to George Du Maurier. Parnell House was designed by Henry Roberts for the 'Society for Improving the Conditions of the Labouring Classes' in 1849. Left at Streatham Street then right at Coptic Street. The Dairy Supply Company premises were built in 1888. Left along Little Russell Street. The Cartoon Museum is housed in a former dairy building. The parish school was opened in 1879. Left at Bury Place then right into Pied Bull Yard. 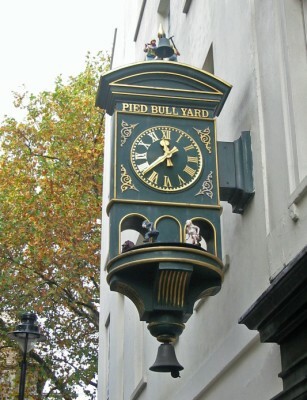 Notice the clock at the entrance (pictured in header). Go around to the right and exit via Galen Court back to Bury Place then go left. There is a blue plaque to Bertrand Russell. Pushkin House at number 5 was designed by Henry Flitcroft in 1744. Opposite are the premises of the Swedenborg Society. The College of Preceptors was built in 1887. Walk northwards through Bloomsbury Square Gardens. These were originally landscaped by Repton in 1806. They were replanted in the 1970s when a car park was constructed below. There is another view of Victoria House on the east side. The seated statue of Charles James Fox is by Westmacott (1816). Terraces on the north side replaced Southampton House around 1800. Left at Great Russell Street. This was built up from 1661. The British Museum was established in 1753, largely based on the collections of the physician and scientist Sir Hans Sloane. The museum first opened to the public on 15 January 1759 in Montagu House, on the site of the current museum. Congress House is the TUC memorial building, designed in 1948 but not built until 1953-7. The sculpture is 'The Spirit of Brotherhood'. There is a better view of the building from Dyott Street. The former YWCA building was designed by Edwin Lutyens in 1930-2 and is now the Bloomsbury Hotel. At the end of Great Russell Street go left at Tottenham Court Road to the tube station. The Dominion Theatre was built in 1928-9 and seats 3000. It was a cinema in the 1930s. The 34 storey Centre Point was constructed by Seifert & Partners in 1959-66 as offices but was converted to housing. The tube station features colourful tiles by Eduardo Paolozzi. A new station will be constructed for Crossrail.